St David’s Hospice is happy to announce that we will be holding a Spring Fair on Saturday 27th April at Holyhead Town Hall from 11am until 3pm. Everybody is welcome and entry is only £1 for adults (pay on entry) and children enter for free.There will be something for everyone with a large variety of stalls including the following, plant stall, fruit and veg, crafts and new spring merchandise from our hospice shop. 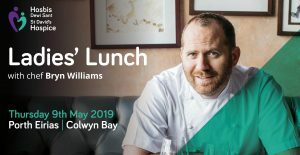 St David’s Hospice welcomes you to an afternoon of fine dining hosted by local celebrity chef Bryn Williams. Join us for an afternoon of fine dining where Bryn and his team of chefs turn simple, seasonal and local ingredients into extraordinary bistro-style food in aid of St David’s Hospice. To give you a flavour of what to expect on the day, the afternoon will start a glass of prosecco on arrival and from there you will take your seat and enjoy a delightful three-course lunch. A licenced bar is available for those wishing to add an extra touch of sparkle to the afternoon. Following lunch, Bryn will talk about his experiences in the culinary world, the success of his restaurants, his life influences and his inspirations. 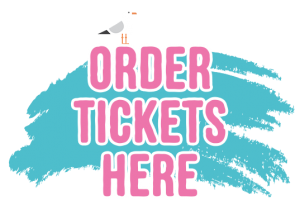 Tickets can be bought online here or by calling the Fundraising Office on 01492 873664. Tickets are limited and are expected to sell out fast. Don’t miss out and join us on this unique experience. Take on the Snowdon Sunrise Challenge and see the sunrise at the top of the UK’s favourite mountain in support of St David’s Hospice. Starting at 1.45am; you will be led by qualified and experienced mountain leaders up Llanberis Path, as you walk through the night up the UK’s favourite mountain. Once you reach the peak around 5 am you will be rewarded with the view of a stunning sunrise overlooking the scenery of Snowdon. You will then make your descent down the Llanberis Path arriving in Llanberis for around 8 am where full breakfast and tea/coffee awaits you at Padarn Lake Hotel. 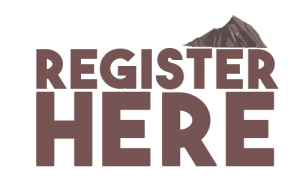 Individual registration is £25* per person (aged 16+). Back for the fourth time by popular demand, North Wales Business Club in association with Barclays will host a “Test the Team” Corporate Quiz Night in aid of St David’s Hospice at Venue Cymru on Thursday 16th May 2019. The popular event will start at 6pm finishing at approximately 9:30pm. Team Entry is £104 per team with a maximum of 4 players per team and includes a welcome drink and a hot buffet supper. 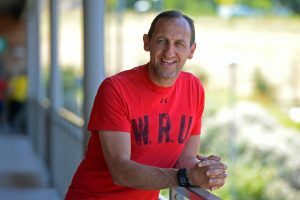 This year’s Quizmaster will be Rupert Moon, former international Welsh Rugby Union Player who will dazzle guests with the innovative and interactive quiz with rounds to suit all strengths. There can only be one winner! In 2018 the ‘Les Quizerables’ team from Barclays Bank took the 1st prize trophy knocking 2017 winners, Dragon Investments off the top spot. Have you got what it takes to take home this year’s trophy? 🎟️ Download our team entry application form here. 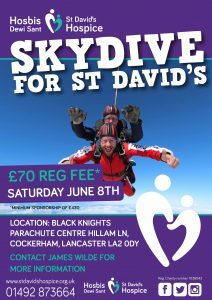 For further information, contact the Fundraising Office on 01492 873664 or email james.wilde@stdavidshospice.org.uk. Please note, whilst there are limited places for this event, you NOT limited to one team per company – why not enter multiple teams – the more the merrier! St David’s Hospice is searching for supporters who want to have an experience that will live with them for a lifetime. See the world from 11,000ft as part of a tandem skydive. 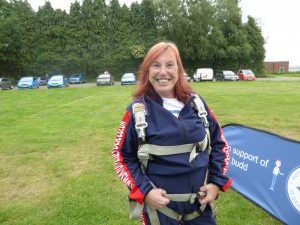 “The skydive was amazing and it was something I wanted to do all my life, I’d do it again tomorrow. “I jumped in memory of my late ex-husband, Peter. The instructor said he would be watching me from the clouds. 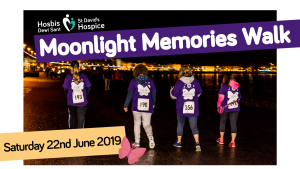 Back once again, the hugely popular Moonlight Memories Walk will be taking place in Llandudno again this year; starting and finishing at Ysgol John Bright School. This is a ladies-only, nighttime 10km walk, raising funds in memory of your loved ones – join in by registering today. A bespoke medal and t-shirt are included (t-shirt includes a writing space for you to show who you are walking in memory of). The St David’s Hospice Dragon Boat Race will take place once again at the beautiful Lake Padarn, Llanberis. The hospice is looking for energetic teams of between 16 and 20 people to go head to head on the water this summer. You don’t need any prior experience on the water and don’t need to be an experienced swimmer – just willing to get wet and get stuck in! There are limited team slots available so to avoid disappointment, please register now! 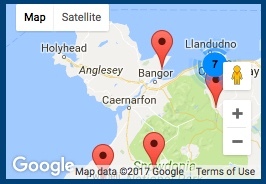 Challenge yourself on our walk challenge across the stunning coast of the Llyn Peninsula and support your local hospice at the same time! Entry to this event s FREE and participants can choose from one, two or take on all three days of our challenge event. The route follows the picturesque Welsh Coastal Path with panoramic views of the Llyn Peninsula and beyond. All funds raised will support local St David’s hospice projects. This event is not for the faint-hearted as each walking day is expected to be approximately 8 hours on tough terrain. *SUBJECT TO CHANGE; DEPENDENT ON ROUTE ADVICE FROM THE TREK LEADERS. 📢📢 MINIMUM £100 SPONSORSHIP PER PERSON FOR THE THREE DAY CHALLENGE. or by calling the St David’s Hospice Fundraising Office on 01492 873664. *This event is for everybody over the age of 18 but unfortunately to the nature of the paths, dogs are not permitted to take part.